Gradually, an original collection took shape, bringing together video, permanent installations, paintings, drawings, sculptures, photographs and digital art. The collection features stowaway sheep, carved fish, crystal tears, and oceans of words. The works travel from Wattwiller to Lisbon via Epinal, Bordeaux or Amsterdam, displaying different points of view and offering a reflection of the modern world. Artists can accompany us on infinite journeys, inviting introspection or denunciation. They are often thoughtful, and their questioning of the notion of vestige could well be the common thread linking the winners of this 7th edition. Edouard Decam is a tireless surveyor of the remote Pyrenees whose works feature abandoned architecture, including dams with mesmerising structures. Cristina Escobar tells the story of men and women refugees in Italy, tracing their journeys on a map of the Mediterranean. She plots each person’s route using 40 marble objects : their “trophies”. 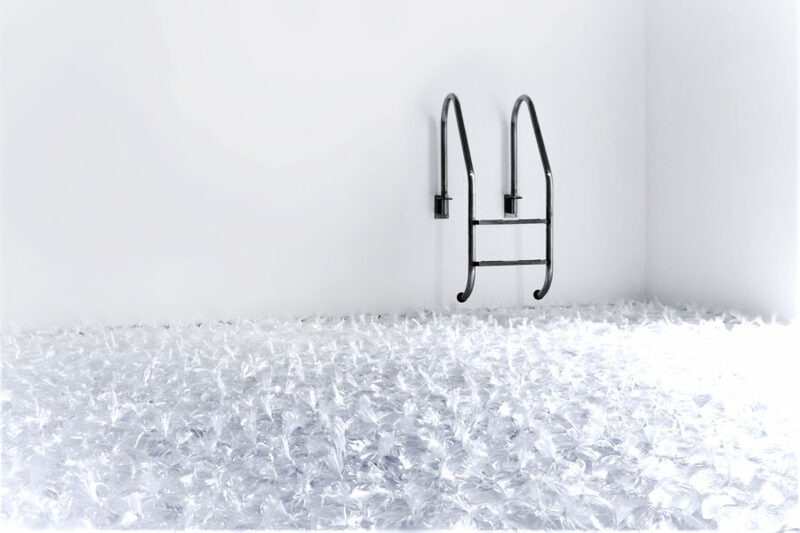 Sara Ferrer uses a minimalistic installation to condemn the impacts of mass fishing and overconsumption. Camille Michel also questions how modernity and industrialisation induce excess. Her photographs document the metamorphosis of Greenland and the daily lives of the Uummannaq people living in the north-west of the territory. Claire Malrieux’s generative work entitled Waterscape excavates the idea of the Anthropocene Era and examines the impact of humans on our ecosystem. Benjamin Rossi goes back even further in human history. His field of study is the Forest of Fontainebleau, formerly the Stampian Sea. The artist takes an impression, the blown glass negative of which is used to capture this long-lost era. Inspired by the flow of water in the Côa Valley in Portugal, famous for its Paleolithic rock engravings, the Sandra & Ricardo collective have created a pool using thousands of water-filled sacks, a metaphor for the birth of civilization. And Maël Nozahic’s pond reflecting a wolf represents the final traces of life in a world frozen in time. Each of the works on display bears the mark of man’s ambivalence. Our impact on our environment is expressed as a form of lyrical despair. The selection of these artists is a reflection of the increased global concern about ubiquitous ecological disasters.